Essex is not renowned for its bats. With over-development, ever-increasing industry and the intensive ‘pharma-cist’ style of agriculture, it is no surprise that the number and species diversity in the county is comparatively low. However, for the past 25 years, a small project has been quietly running at the Marks Hall estate between Braintree and Colchester to help rectify this sad state of affairs. In 1985, as the local Forestry Commission forester, I sought advice from John Dobson, chairman of the Essex Bat Group, as to the status of the bats in the estate woodlands, in particular where they roosted. He immediately found a brown long-eared bat roost in my garden shed of which I had been completely unaware. This sparked an interest and the Forestry Commission, keen to foster such interests, sent me on a course to learn more and acquire the necessary licence (to work with bats it’s a legal requirement to hold a licence from Natural England). 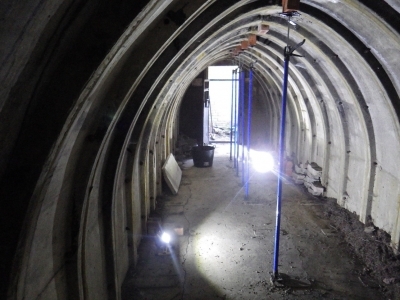 Subsequently, we surveyed likely hibernation sites (20 Second World War air-raid shelters). We only found one bat, but all the structures had bat feeding debris present (droppings and insect wings). Further consultation with John resulted in a plan to adapt one of the shelters to make it more bat-friendly. This involved cleaning it out (no small task), casting a bespoke concrete slab to cap the escape hatch, fitting a door that would exclude people but allow bats access and installing hand-made ‘bat bricks’ (provided by John Goldsmith from the Norfolk Bat Group). The insides of the shelters were so well constructed that the concrete was too smooth for bats to get a foothold and there were virtually no crevices for them to get in to. The bricks addressed this, each providing six roosting crevices. Most of these were installed in the apex of the ceiling. This work had several benefits in addition to helping bats. The shelters had been suffering a lot of vandalism, litter and fires, but this essentially ceased once the door was fitted. They were also a significant safety hazard – especially the open escape hatches hidden among brambles – so the new concrete caps made quite a difference. Such a large assemblage of shelters is now rare, so they are of archaeological interest (which makes me feel rather ancient!). This work has helped slow their deterioration. We only had to wait three months for success – bats occupied the shelter in the first winter (1993) and we have been monitoring them over the following 25 years. Under the watchful eye of John, the Forestry Commission, Marks Hall Trust, Essex Biodiversity Project, Writtle College and many individuals have continued the project and we now have 17 shelters adapted, all of which have been occupied by bats). 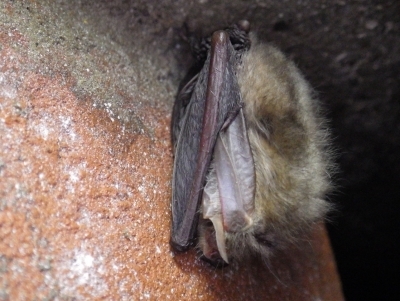 The Marks Hall shelter complex is now the best hibernation site for brown long-eared bat in the British Isles, the second best for the very rare barbastelle bat and globally significant for Natterer’s bat – no small achievement for a cluster of old military ruins in a bat-poor county. The hibernation sites are only part of the story – the surrounding habitats have also undergone significant beneficial change. The Marks Hall Trust has done sterling work reinstating some of the old deer-park grassland and continuing the traditional coppice management of the neighbouring woods. The Forestry Commission has been reverting the conifer plantations back to native broad-leaf species and restoring the many woodland ponds to a healthier state. 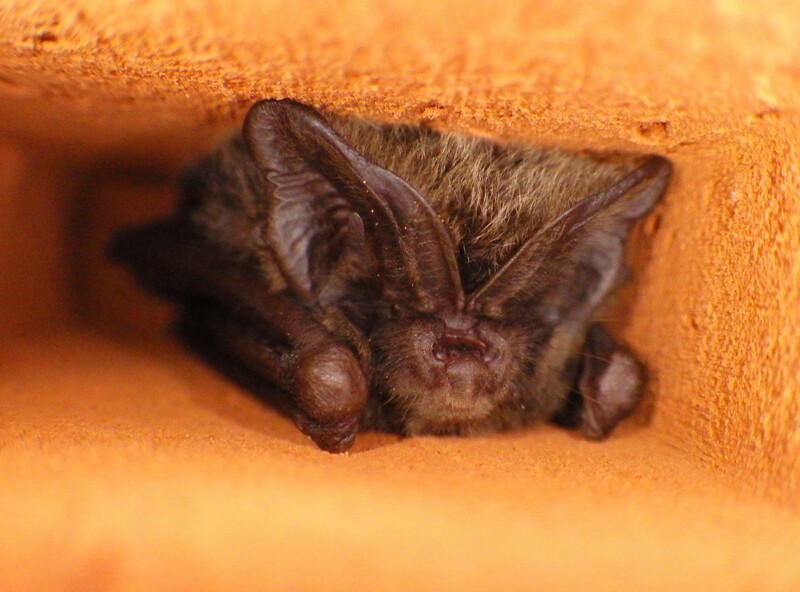 So now the bats – and a multitude of other species – have a site that provides both ‘bed and breakfast’. The Essex Bat Group are engaged in further research of the estate bats, using remote sensing devices. There is still much to do and we are still ignorant of the status and needs of bats, but it’s a start. Hopefully, this work will continue and the whole estate will continue on a path towards greater biodiversity. If anyone wishes to know more, the trust sometimes run bat walks in the summer, while Mammals of Essex by John Dobson and Darren Tansley is well worth a read.